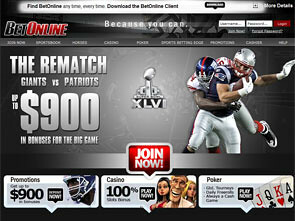 Bet Online sportsbook gives you a great chance to enjoy the favourite sports and win some money. 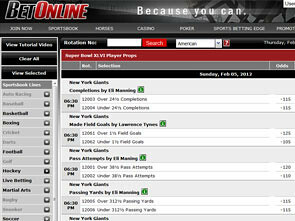 This web site has nice graphics and a good user-friendly interface, which helps you enjoy every moment at Bet Online. This sportsbook is oriented on USA bookers, so you can only use English language, and bank with US Dollars. It doesn’t matter, what is your favourite sports. You can find anything you like at Bet Online. This system suggests you to bet on Football, Basketball,Baseball, Soccer, Tennis, Golf, Auto Racing, Hockey, Snooker and some other popular sports. 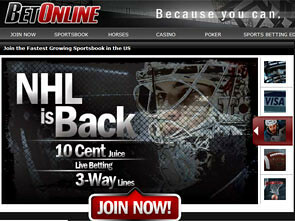 The site also offers you Live Betting to exclude the unnecessary waiting. You will get several interesting bonuses at this sportsbook . The most interesting of them is the fantastic 25% up to $900 Deposit Bonus. It is awarded every time you credit money to your account via WesternUnion, MoneyGram, Moneybookers/Skrill, NETELLER or Bank Wires. The bonus is awarded only if you enter the TXBONUS code when making the deposit. The minimal sum to get this bonus is $50, and the wagering requirements are 6x. Also, you can get a similar bonus if you transfer using a credit card. In this case you get the 15% up to $900 Free Cash for every deposit over $50. The wagering requirements for this bonus are also 6x, and the promo code you need to enter on the deposit page is CCBONUS. You can also get Cash Back Bonuses at Bet Online. When you stake on regular hockey matches, and your stake looses, it is possible to get the money refunded. The maximal sum you can get back is $250. Another option to get the refunding is soccer. If you bet on Over in a certain match, and it ends in Nil-Nil, you can get up to $250 back. The cash backs have to be claimed at freeplay@Betonline.com. To play Bet Online you need to complete a couple of easy steps. First of all, register a new Real Money account. For this provide the casino with your basic data including the full name, birth date, address and contacts. After the new account is verified, all sportsbook is at your service, so you only need to deposit, choose the favourite sports, and make your first lucky bets. Don’t forget to claim a bonus while making the deposit. After that you will have to wager the sum you got 6 times. Also, you can use your mobile device at Bet Online to keep track of your favourite games wherever you are and to make hot bets. 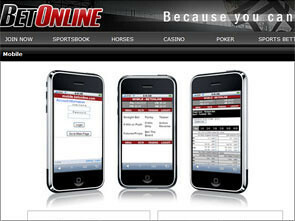 For this you simply need to go to mobile.betonline.com and choose the option you need. This company has over 20 years of experience on the betting market, so they know what banking services are the most popular among their bettors. At Bet Online you can deposit using Visa, Person To Person, MoneyOrders, Moneybookers/Skrill, NETELLER, Book to Book, Bank Wire and Bank Check. The payout methods are almost the same: Bank Check, Bank Wire, Sach, Person To Person, Moneybookers/Skrill, NETELLER and Book to Book. The minimal deposit sum is $10. The withdrawals vary between $25 and $8,000. Also, you can find many answers to the most common questions in the Help section of Bet Online official web page.